We have done work for comanies as far away as Florida and the Upper Peninsula in Michigan but we had yet to do a site for a Bay Area Company. 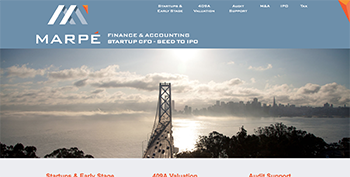 We met Glenn of Marpe Finance through a social situation and ended up doing a new website for him. He was looking to compete on style and features with his major competitors and we think we did an amazing job. The most interesting part about this project was the end. Glenn had an opportunity to present his business in front of a group of entrpreneurial students at U.C. Berkeley, but he only found out about the opportunity a week and a half in advance. We were nearly done, but the new MarpeFinance.com site needed to be up in time for the event. In addition Glenn needed a video shot and produced about his company. This is outside our wheelhouse but we knew a guy... Well, the video was shot, the site was finished, and Glenn presented his accounting firm to a group of future entrepreneural leaders all without a hitch. It was a fun ride but I don't want to have to do it again.